Totally flabergasted by the fact that one of the kitchens (ahem… Hillary…) has not tasted most of the amazing bounty that comes from the sea, we set out to change that. 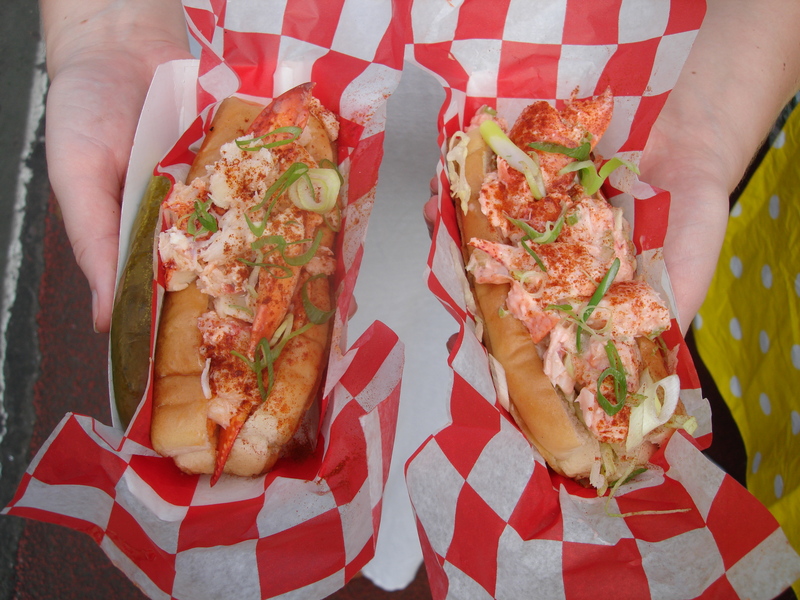 With lobster on the brain, our first mission was to find the best lobster rolls this city had to offer — we headed to Brooklyn Flea in Fort Greene to taste the Red Hook Lobster Pound rolls. We tried one Maine style: cold with homemade mayo, and one Connecticut style: warm with butter. Listen, we’re not on the Cape, we’re not on the Vineyard, we’re not in coastal Maine. We’re in New York so we’re doing things our way, which we decided was cold with homemade Old Bay mayo on a toasted, buttered roll. Even though making your own lobster rolls may seem daunting, it seriously is a “one pot” meal, and comes together really very quickly. 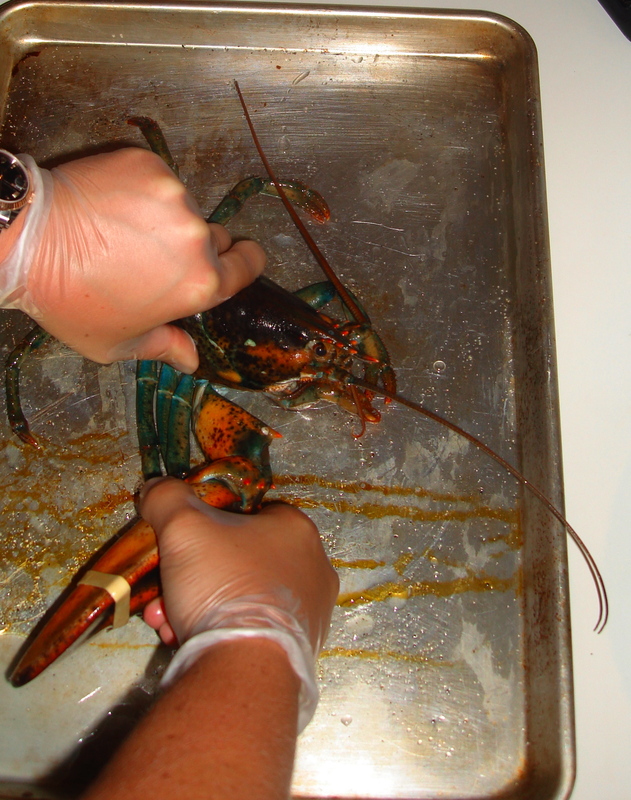 First, get a short broth going to poach the lobster in and to give it a little flavor. 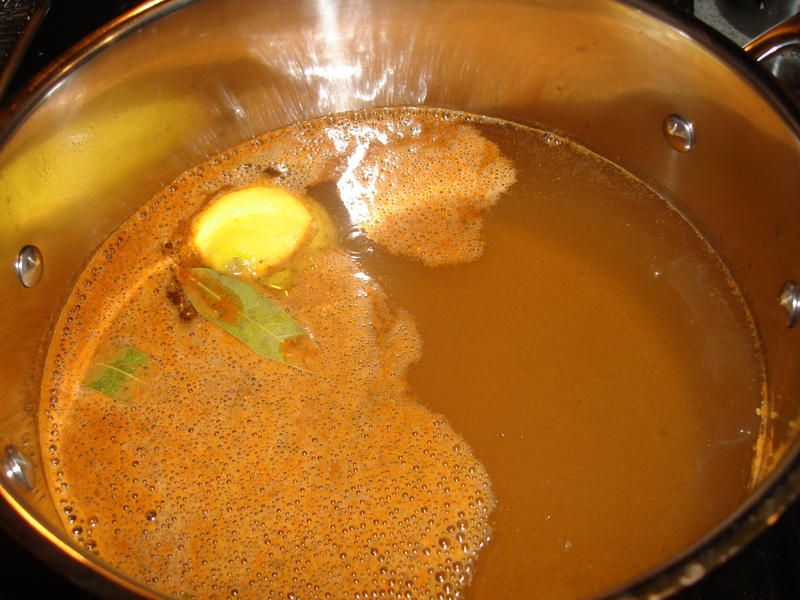 Fill a large stockpot with water, then add one tablespoon of vinegar (doesn’t matter what kind), a big pinch of salt, a couple bay leaves, half of a lemon, and two tablespoons of Old Bay seasoning. Let that simmer for about 20 minutes. Next it is time to put together this delicious Old Bay mayonnaise (making the mayo from scratch of course). 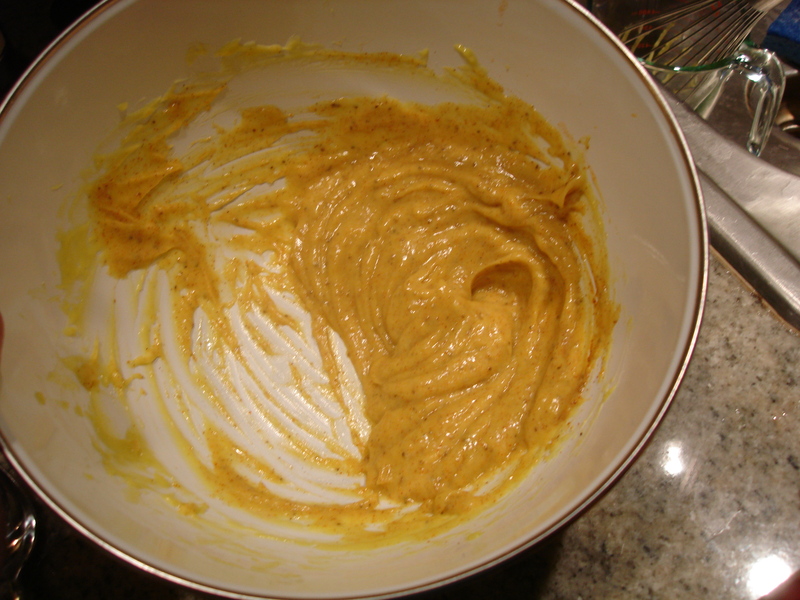 With a balloon whisk, combine the egg yolk, mustard, salt and vinegar. 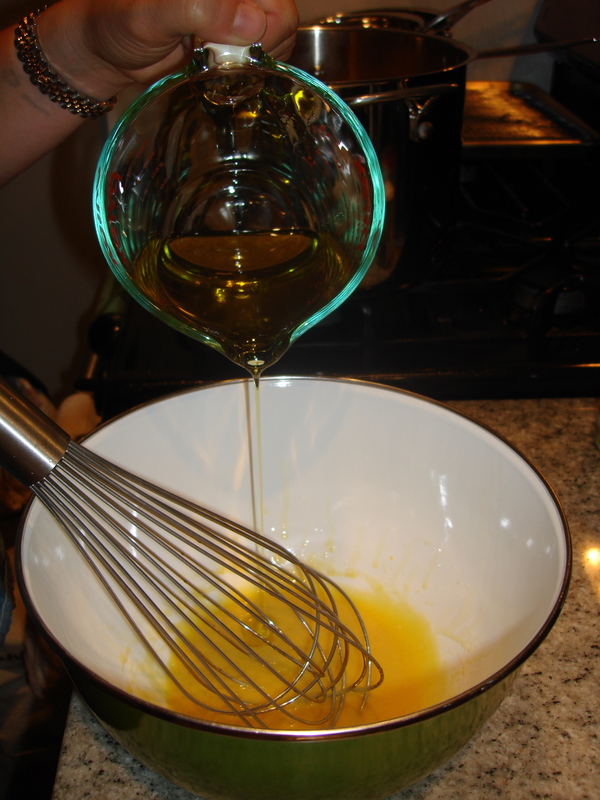 In a slow stream, add the oil to the mixture, whisking vigorously to emulsify. Add the remaining seasonings in slowly, whisking to combine and tasting frequently. Set the mayo aside in the refrigerator. 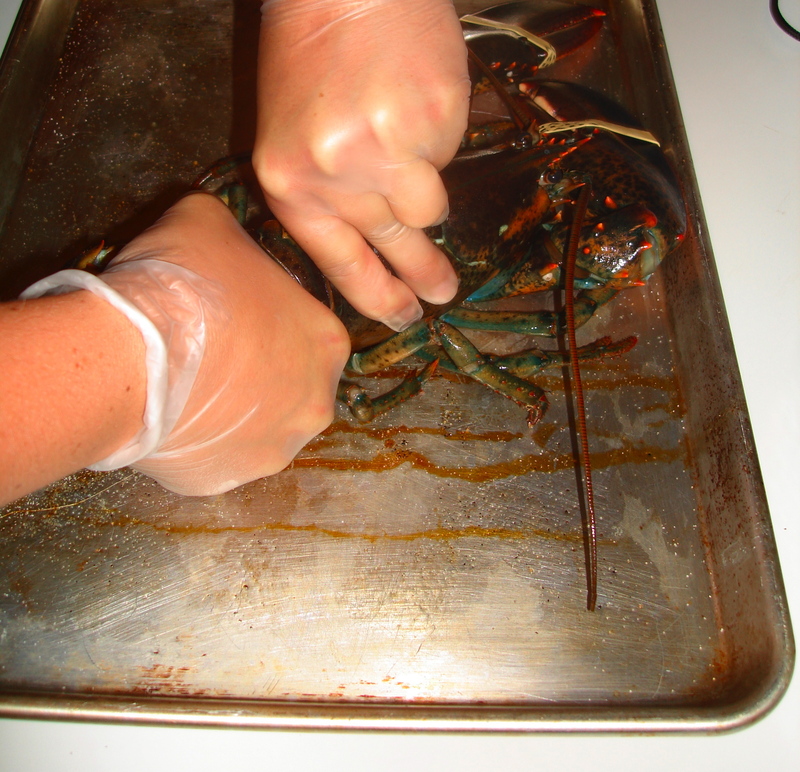 Now for the lobster… you will probably want to have a glass of wine or a shot of tequila before this next step. 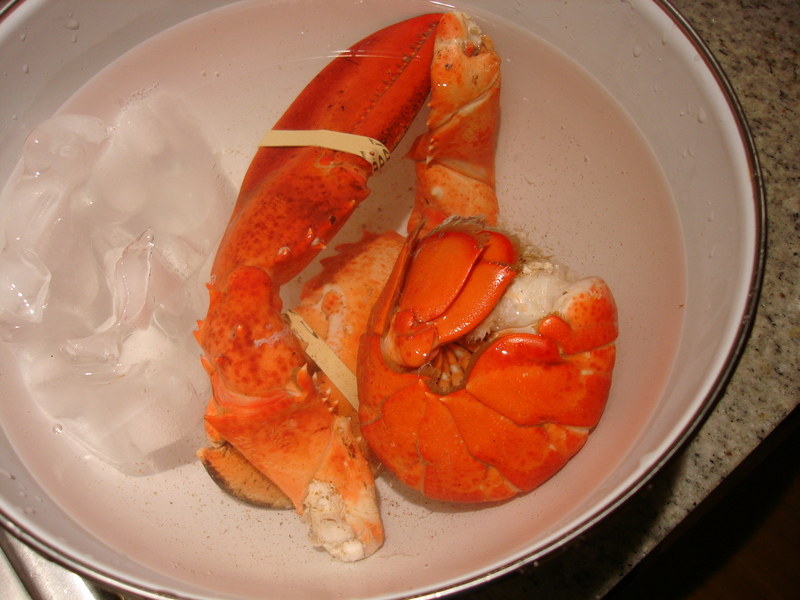 We procured our lovely 2lb lobster from The Lobster Place in Chelsea Market and let him sit in the refrigerator for a bit while putting together the broth and the mayo. 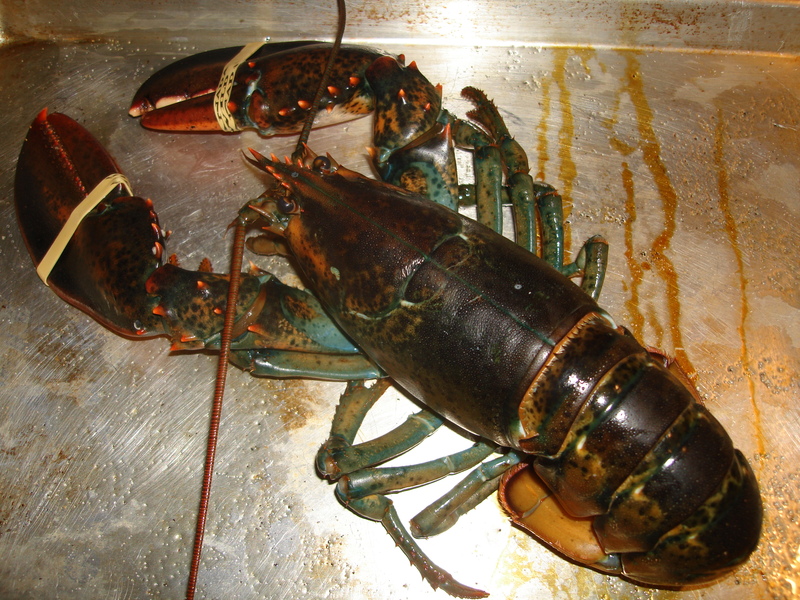 Amy fearlessly tore him limb from limb… first separating the tail from the body by twisting both in the opposite direction (this should instantly kill the lobster although it may keep moving… do not be deterred) then remove the claws in the same fashion. …reserve the tail, and claws for the lobster rolls. Do what you will with the rest. 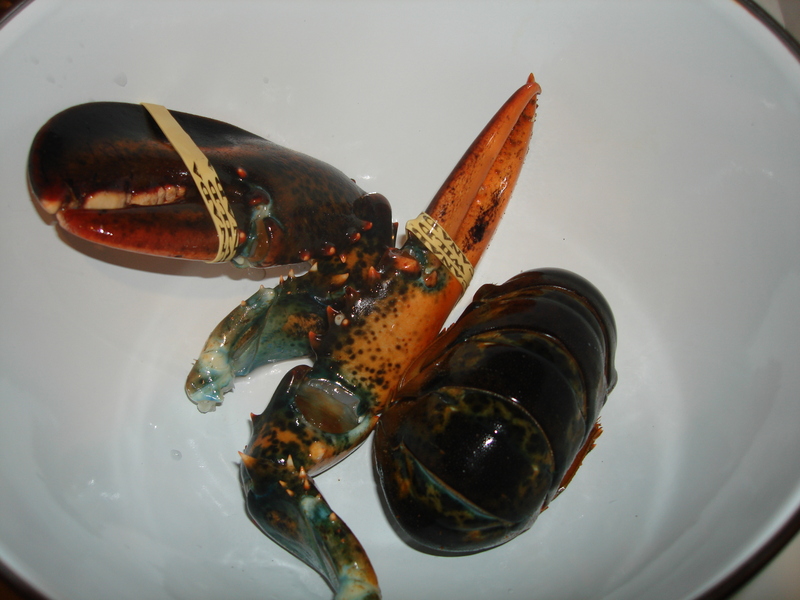 Poach the tail and claws in your broth for 8-10 minutes, then place them directly in an ice bath. Now for the tricky part, removing the meat from the shells. We highly recommend working over a bowl, sink, newspaper, etc – this can get messy. With the tail on its side, give it a good press until the shell cracks, this will make it easier to split open the shell and obtain the meat in one fell swoop. 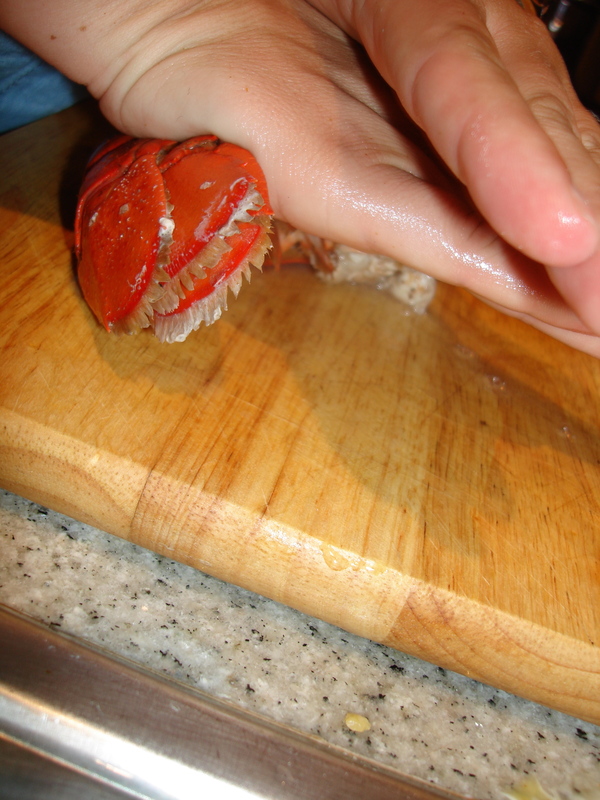 For the claws – using the backside of a heavy knife whack the bottom part of the claw until it cracks, repeat on the other side, this should break off the shell and the claw meat should come out in close to one solid piece. Don’t forget all the meat in those knuckles now! Take kitchen shears and cut through the joints attached to the claw to grab all that delicious meat! Dice the meat, and refrigerate for a little bit as you clean up — you don’t want any hidden lobster bits stinking up your kitchen. Time to prepare the rolls. We bought 6 small soft dinner rolls from Amy’s Bread, and boy are we glad we did, yum! Slice each roll almost all the way through, then brush the inside (generously…) with melted butter. In a 350 degree oven, toast for about 5 minutes. Remove from the oven and at this point you can brush them with additional butter (we say the more butter the better). Now for the finishing touches. 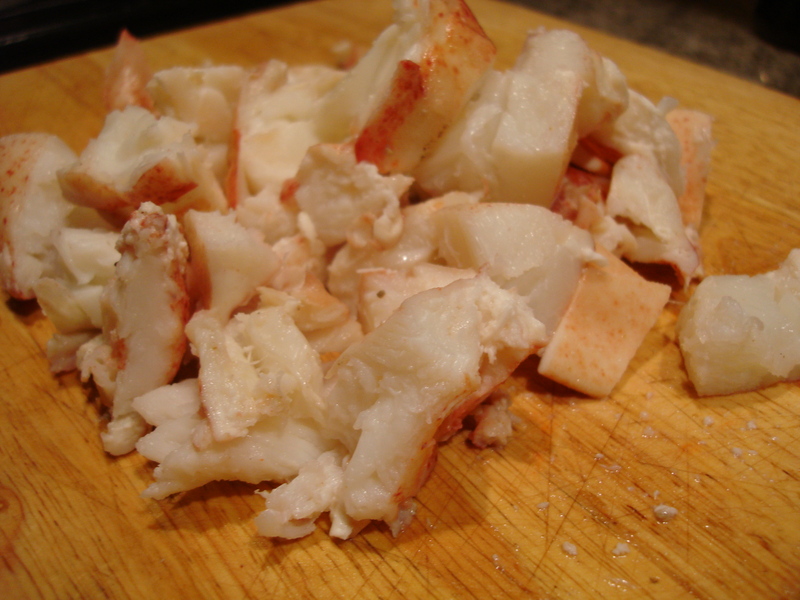 Combine the chopped lobster meat with the Old Bay mayo (little by little) until it is just right. At this point we mixed in some chopped fresh herbs – tarragon (this was KEY! ), chives, parsley, and scallions, reserving some for sprinkling on top. Generously fill each roll with the lobster meat, sprinkle some more herbs on top, open up a crisp bottle of rose and DIG IN. Not to toot our own horn or anything, but the Red Hook roll didn’t hold a candle to these. Seriously, some of the best lobster rolls we have ever tasted. Enjoy! 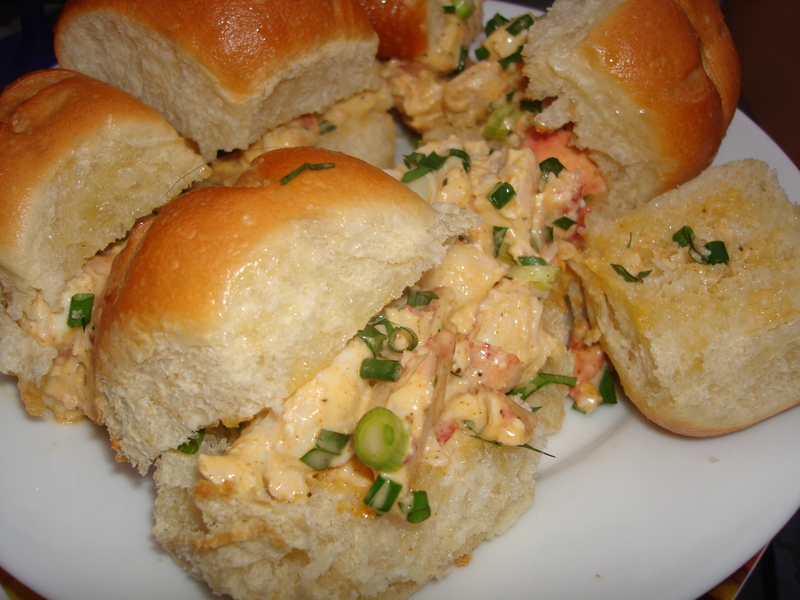 This entry was posted in Lobster and tagged Amy's Bread, chives, dinner, lobster, lobster roll, Maine, mayonnaise, Old Bay, Red Hook Lobster Pound, scallions, seafood, summer, tarragon. Bookmark the permalink.